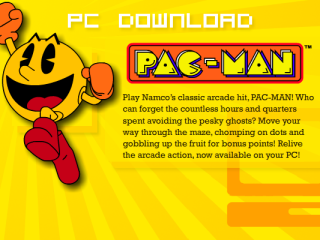 Namco Bandai has been showing off a new multi-player arcade version of its classic Pac-Man, called Pac-Man Battle Royale. Arcade Heroes spotted the new Pac-Man arcade game at this year's Amusement Expo 2010. Namco was celebrating the 30th anniversary of Pac-Man, showing off two Pac-Man Battle Royale cabinets at the recent event in Vegas. Arcade Heroes notes that "while the game has intention of showing up in bars, it will work anywhere and it is not actually like Pac-Man CE at all, except for the graphics and changing mazes. Fundamentally, this new Pac Man game is not about scoring the highest score, but about beating (and eating) your mates. You can see Namco's beautiful arcade cabinet demo'ed in the YouTube video right below these words. It's due for release in September. TechRadar will be badgering Namco to find out when and where we might get a go on one in the UK later this year.